Celebrating 100 Years in Public Health! You are here: Home / Celebrating 100 Years in Public Health! 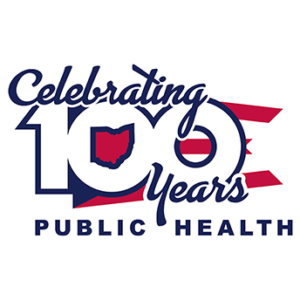 100 years ago, Woodrow Wilson was president, World War I had just ended and public health in Ohio was in need of some organization. The enactment of the Hughes Act and the Griswold Act provided that much needed re-organization and laid the foundation for public health efforts still in effect today. In the 100 years that have passed since the enactment of Hughes-Griswold, public health has had a significant impact on health and quality of life: People are living longer, immunizations are available to prevent 18 deadly diseases; food safety and sanitation has improved and motor vehicle fatalities have been reduced by 90 percent. While the last 100 years have been filled with much success and progress, the next 100 years promises to show the ever-growing presence and importance of public health in our everyday lives. 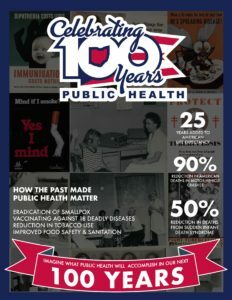 Join us as we celebrate 100 years of public health with the theme "How the past has made public health matter." 1920s Maternal and Infancy Act enabled state health departments to employ nutritionists, and during the 1930s, the federal government developed food relief and food commodity distribution programs, including school feeding and nutrition education programs, and national food consumption surveys. 1974 Federal WIC Program begins. WIC offices open in local health departments in following years. 1986 Ohio mandatory seat belt law went into effect. (May 1986) Ohio became the 17th state to require drivers to buckle up.